Cindy is a recurring backgrounder at Lawndale High. 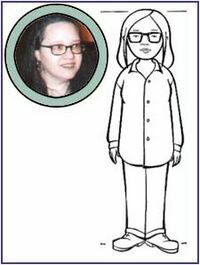 She is visually based on Daria producer Cindy Brolsma, who she's named for (and in several fanfics has been given the surname "Brolsma" as well). She wears glasses, trapezoidal in shape and mounted in thick dark frames. She usually looks pleasant and cheerful. Appearances by Cindy show she is a big school sports fan, appearing to watch various Lawndale Lions games (Kevin's fumble in "The F Word" had her grabbing her head, aghast) and also the Lawndale High Track Team. She seems to be a fan of Z93's Mental in the Morning as well, cheering them on in "Jake of Hearts". She follows the school fashion trends, donning all-black like Quinn in "Quinn the Brain" and wearing the school colours in "The Lost Girls", and went to the dance party in "Daria Dance Party" (where she was seen dancing with a boy she'd met). She was invited to the Fashion Club's 'Fashion Don't's' party and came in full costume in "Monster". Cindy likes to visit The Zon too, in "Ill" and "Pierce Me"; both times are when Mystik Spiral was performing, so she might be a fan. She also volunteered in the same soup kitchen as Jodie Landon in "Is It Fall Yet?". We don't know her academic ability, though she looked disappointed with her marks from temp-teacher Daria in "Lucky Strike". In "Dye! Dye! My Darling", before Jane learns of The Kiss, Cindy can be seen talking to a boy (who may be Les); the poses suggest he's either chatting her up or they're already going out. Cindy didn't appear in any fanfics until December 2010 (when this page was created on the old wiki), when she debuted as a computer coding nerd in cfardell_Brenorenz29's Quinn's Code story. In spring 2011, she began appearing as a significant secondary character in God Save The Esteem as an accidental 'queen bee' at Lawndale High, and in the Lawndale Fighting Championship series as an enthusiastic rookie wrestler on her way up. Mainly, she appears in alternate universe fanfiction. 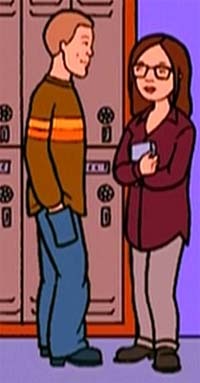 Two exceptions were cfardell's Post-Canon "A Question of Cindy" (explaining she graduated early by doing advanced classes outside of Lawndale High) and First Day of Summer. This page was last edited on 6 May 2018, at 01:09.